Dye vorred sand Bonaventura uber den plsater virginis Marie. Authorship attributed to Pseudo-Bonaventura (GW). Title from incipit, printed in red, leaf a2r. Place and date from colophon, leaf r8v: Un[d] ist volendt zu Nürmberg auff Donerstag nach unser fraue[n] Leichtmesstag in de[n] funtzehenhu[n]derste[n] iar. Printer identified by Hölzel's type 4:87G. Assigned to Ambrosius Huber in Goff. Signatures: a-r⁸: 136 leaves, leaf a1 blank. Cited as 16mo in ISTC from BSB-Ink, but 8vo in GW and 12mo in Goff. Often found with Ein hübsche Lehre ... (ISTC il00125000). PML copy leaf dimensions: 11.5 x 8.7 cm. 16th-century Augsburg blind-stamped pigskin over wooden boards (12.5 x 9 cm. 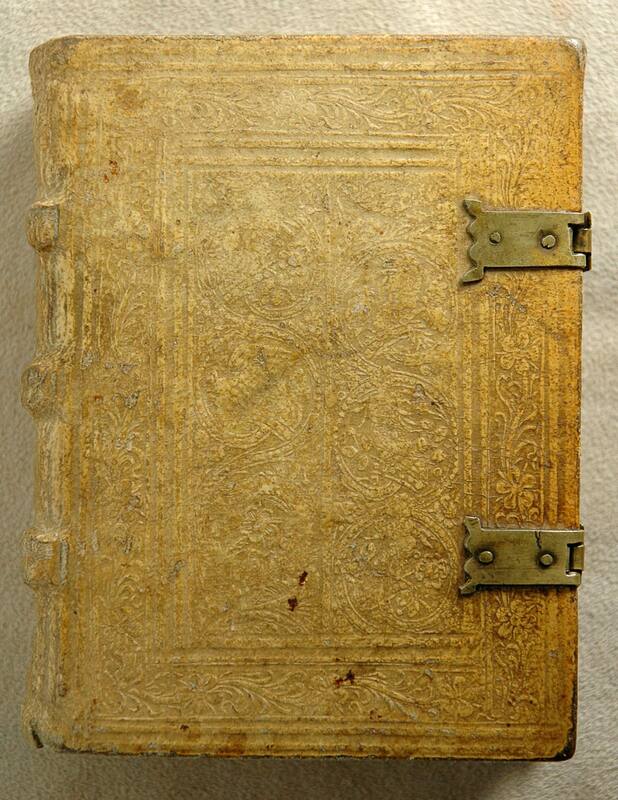 ), sewn on 3 supports by the bookbinder of Raimund Fugger (possibly Simon and Friedrich Thumb, EBDB w004667). Plain paper pastedown (rear), evidence of Hebrew manuscript pastedown (front); decorative endbands. 2 clasps. Hand decoration: Rubrication not required. Annotations: No marginal notations in text. Bertram Ashburnham, Earl of Ashburnham (1797-1878), with shelf mark: 8.C (front pastedown); his sale, Sotheby's, 25 June 1897, lot 752; Charles Fairfax Murray (1849-1919), booklabel (front pastedown); his sale, Christie's, 10 Dec. 1917, lot 93 purchased by Quaritch (with collation note, rear pastedown) for Morgan; J.P. Morgan, Jr. (1867-1943), purchased Dec. 1917 (accessioned 1919).